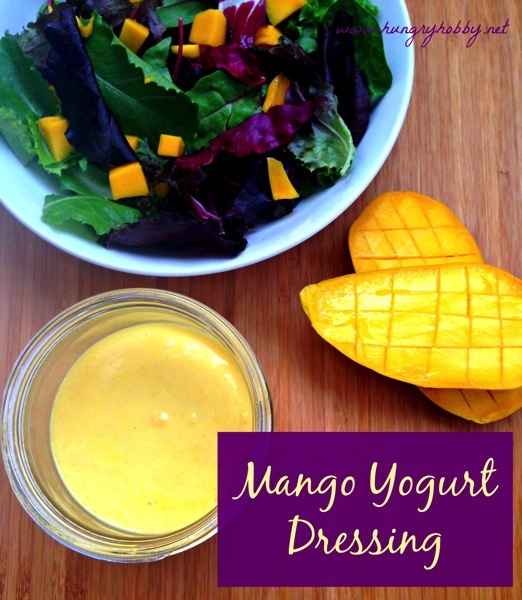 Ever since I had the Mango Yogurt Dressing from Zuppas Cafe, I knew I needed to recreate the dressing or get more SOON. So on Tuesday while I was waiting for the man to work on our dryer I whipped some up! It definitely hit the spot and Paul loved it too! It was so easy and turned out so yummy that I decided to put it in a nice pin-able image! I could literally eat this stuff by the spoonful, okay I may have eaten a couple spoonfuls, it’s DELICIOUS! I have a meeting today that doesn’t start till a little later than I normally go in, so I’m enjoying a calm breakfast at home with a cup of decaf coffee! Have great one everyone! What a great idea! This looks delicious! This sounds absolutely delicious and so easy to make too! What a great way to add some flavor to a simple salad. Thanks for sharing! Your welcome! It is amazing, definitely give it a try!